Cauchy was renowned for his strong work ethic. For those without comedic tastes, the self-proclaimed experts at Wikipedia have an article about Augustin-Louis Cauchy. We never have more than a half pound of bread - and sometimes not even that. This we supplement with the little supply of hard crackers and rice that we are allotted. We go to sleep hungry and dream of one day owning two cows that we might have cheese. Until several hours ago, Cauchy was thought to have been French. Recent discoveries and archaeologists have revealed an earlier model buried in the Archy Bunker, leading us to conclude that Cauchy was in fact a Welsh. The three famous mathemagicians Laplace, Lagrange and Big Norman were frequent visitors to the Cauchy family home, and this combined with the lack of available mouldy bread made it somewhat inevitable that the young man would catch mathematics. A month or two later, Cauchy caught it as well. As a Mathemagician, Cauchy made great strides into the field of Analysis, inventing a whole new hillock of it which he named Cauchy Analysis (later renamed Complex Analysis). This new science caught on quickly, and soon everyone was talking about it; especially Cauchy. A result of deep and far-reaching consequences, Cauchy's Theorem states that any sufficiently poorly-behaved function on the Complex Plane is a biholomorphism: one which maps bad numbers to good numbers, but also turns them inside out in the process. Proof: The set S of functions which are poorly-behaved and not bioholomorphic is formed. Said functions are then isolated and ostracised from social events. Drawing on the power of Cauchy's Theorem, Cauchy's Other Theorem goes on to prove that all functions on the Complex Plane can be classified as being either biholomorphic, homomorphic or so-called 'straight functions'. Proof: The difficult bit is proving that a direction for any given function can be found. Then by watching how the direction changes over time, it can be found out which way the function bends. Eh, something about maths. Who cares? A more refined version of Cauchy's Integral Formula (casual), this proves that the integral of a homomorphic function round any closed curve must total a gay number. Proof: Originally left as an exercise for the interested, nobody has yet taken the time to prove it. A less fattening variant of Cauchy's Theorem, this one shows that a closed bounded function must achieve maximum refreshment and minimum calorie intake at a point in the complex plane known as a 'Pepsivalue'. Proof: Let epsilon be greater than zero. Let Pepsi Max be the only soft drink offering flavourful refreshment and that genuine Pepsi flavour. Then as the function is bounded, it must be thirsty and badly in need of a Pepsi break. Let P1, P2, . . . Pn be a sequence of points within the bounded region. Then the thirst for life must increase as n tends to infinity. The region is closed, so the limit point of the sequence Pn must exist and be utterly parched. But Pepsi adds life, so clearly the function's Pepsivalue is the limit point of this sequence. Buy Pepsi. As Cauchy's Theorem Lite, but this one has the distinctive wood-smoked flavour that only comes with finest oak-aged theorem. Not one of Cauchy's most coherent theorems, this one was shot down after accusations that it was just an elaborate way for Cauchy to propose to his beloved. She turned him down. Rather disappointing after the insight in Cauchy's Theorem, this theorem proves the rather flashy but ultimately hollow result that any 'straight' function in the complex plane, while not turning, must eventually return to its starting point. For this reason, it is also commonly known as Cauchy's Theorem: Revolutions. Proof: Using the technique of Matrix Inversion, it is shown that at any given point in the complex plane, the function is only able to continue in one of two directions. Thus the problem is of choice. This reduces the proof to that of an earlier problem, which is probably solvable. Cauchy did, of course, make great progress in fields other than Analysis. Among the developments he is famed for are the capture and domestication of the integral, the introduction of the straight line to geometry, Cauchy's Number, Personal space, Pythagoras' Theorem, Godel's Incompleteness Theorem, the Laplacian (or 'Cauchian' as he preferred to call it), Fermat's Last Theorem, and the bringing of toys to starving African children. Cauchy strikes fear into the hears of the Cholestorol Collective. It was not, however, until Cauchy was bitten by a genetically-modified croissant that he achieved true fame and performed the many works for which he is famous. 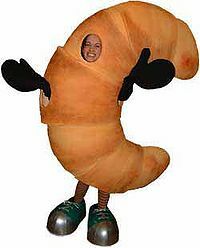 Through the magic of 3D computer graphics, the crossiant's genes mixed with Cauchy's and he gained the ability to control all deliciously light breakfast pastries, as well as an inherent buttery deliciousness. We all remember the famed adventures of the Human Croissant as chronicled in DC Comics, in which the Human Croissant does battle against the evil Cholesterol Collective: the Sausage Kid, Baron Bacon, the Fried Slice, and the heinous Egg Twins: Sunny Side Up and Sunny Side Down. However, what the comics won't tell you is that the Human Croissant is none other than Augustin-Louis Cauchy. This startling revelation is concealed in a unique episode of The Human Crossiant which went regrettably unpublished after a senior DC Comics executive described it as "just the word Cauchy written on a piece of paper over and over again". The so-called "Cauchy's Episode" of The Human Croissant is now a valuable collector's item and is viciously fought over by twats. This page was last edited on 30 June 2012, at 02:49.